Add black peppercorns, coriander seeds, cumin seeds, and cardamom pods to a pan set over medium heat. Toast for approx. 5 – 7 min., or until fragrant. Remove from heat and allow spices to cool. 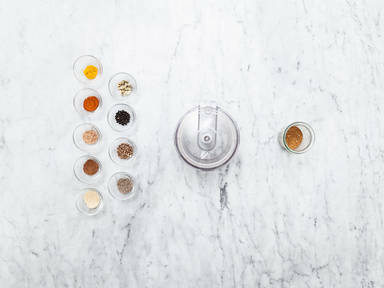 Transfer cooled spices to a food processor and blend until finely ground. Add ground ginger, cayenne pepper, cinnamon, ground nutmeg, and turmeric. Mix until combined. Store in an airtight container in a dark, cool place. Enjoy!